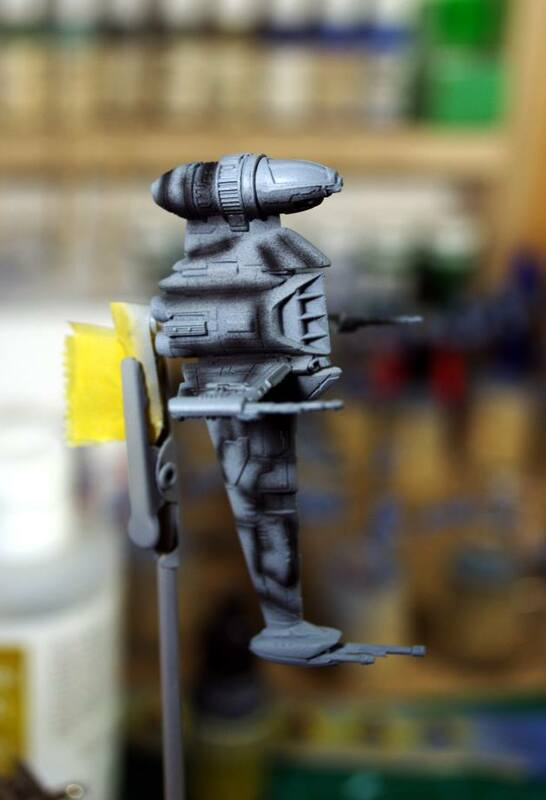 Repainting ships for the X-Wing Miniatures game is a popular hobby for many players. Though the ships come prepainted (surprisingly well, I might add), adding a little personal flavor is what keeps this hobby fresh and exciting! 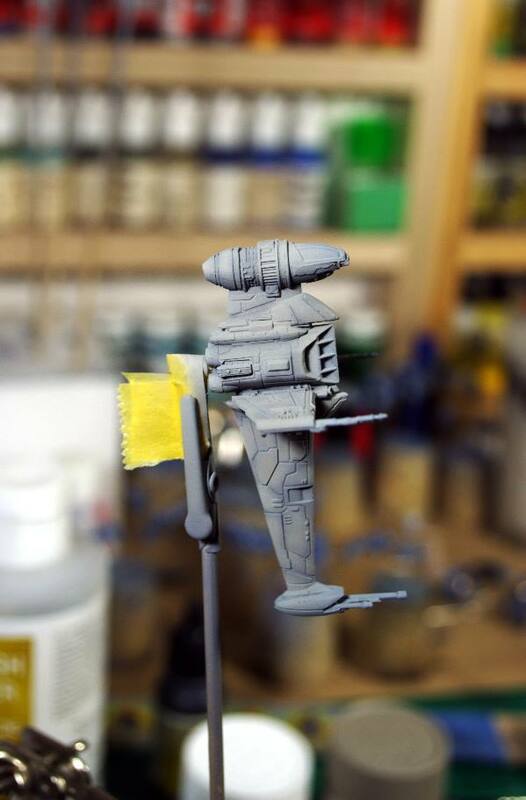 One of the questions that is often asked on the forums is how to paint Rebel ships in their distinct off-white color. Of course there are multiple ways to go about it, but this is my preferred method. 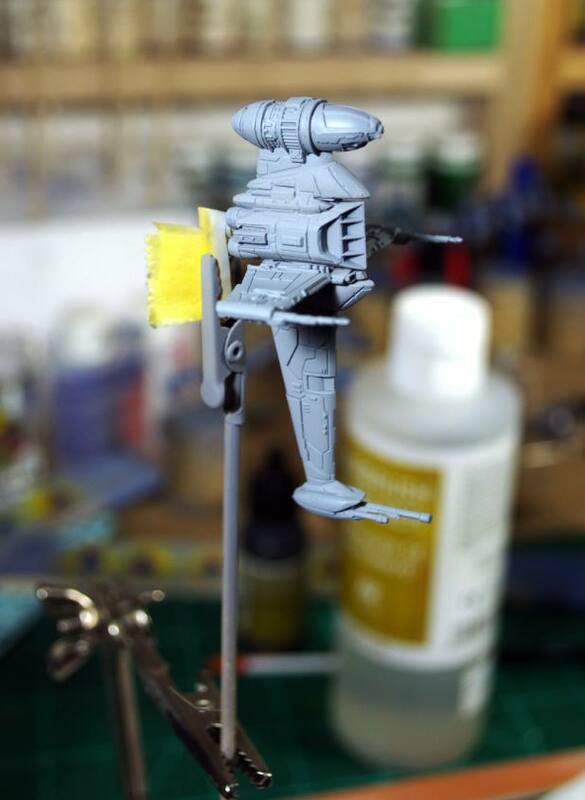 I also wanted to help dispel the notion that an airbrush is only useful for painting large models. The first thing I do is soak the miniature in Super Clean overnight to help remove some of the factory paint, I wash it with warm water and dish soap. After the model is dry, I remove any visible mold lines with a hobby knife. Stripping these miniatures is not always necessary as they tend to take paint rather well straight from the package. However, I tend to do this because the wash applied in the factory can be heavy in some places and I prefer to start with a clean slate. Even if you choose not to strip the miniature, washing it with warm water and dish soap is a must because there can sometimes be an oily residue on the miniature left over from the manufacturing/painting process in the factory. Next, I preshade the entire model using well-thinned Tamiya Flat Black (XF-1). I keep the pressure low, around 15 psi, and add paint to wherever I want a shadow to be and along the panel lines. This part doesn't have to be perfect as the next step will help hide some of your crimes. The main reason I use a primer for the first step is make the entire model a uniform color for the preshading stage,which is important for the next step. Now the model is ready for the base color. 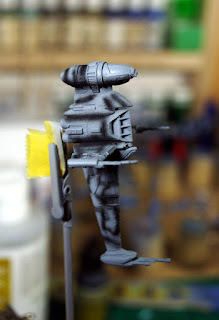 I use a 1:1 mix of Tamiya Flat White (XF-2) and Tamiya Medium Grey (XF-20) to make a nice light grey that is slightly warm, which I find perfectly contrasts with the cool grey that the Empire's ships are usually painted. I then spray the model in multiple light coats of the color, taking care not to apply it too thick and obscure the preshading underneath. You can also use this time to fix any stray Flat Black from the second step by applying it a little more heavy handed in the areas in question. After this is done, you can start painting the detail areas as you see fit. In this case, the B-wing will be painted in Blue Squadron livery to match some B-wings I had previously painted. Stay tuned for Part 2 where I cover to paint Blue Squadron livery on this model!